Receive 8 bottles from our Tobacco range every month. Please select a flavour and strength below, you will be sent 8 bottles of your chosen flavour every month. 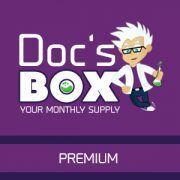 The Doc’s Box is an excellent way to take the hassle out of ordering your monthly supply. For one low monthly payment, your order will be automatically sent out to you the same date every month. Your monthly box will contain 8 bottles (10ml each) of your chosen flavour and strength. Once ordered, your new Doc’s Box subscription will appear in your Account area with the option to cancel at any point. There is no contract or minimum term so you are free to cancel and restart your subscriptions whenever you like! The first payment of your subscription is taken during checkout, with all other payments taken the same day of each month.